8 pp. Roman, 276 pp. The present bibliography contains more than 2,600 titles concerning the speaker community of the voltaic languages (also called Gur languages). 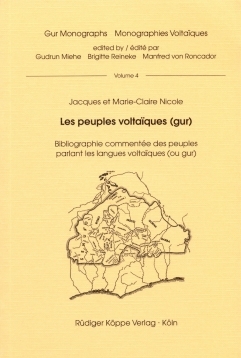 It complements the primarily linguistic bibliography Les langues gur (voltaïques) by M. von Roncador and G. Miehe, published in 1998 as volume 1 in the same series (see link below). Apart from complete descriptions of individual ethnic groups the book also includes studies of various ethnographical aspects (i.e. the social organisation, law and political structures, economy, material culture, religion and magic, etc.) and comparative studies. Included are materials which consider these societies under additional aspects apart from anthropology, like studies of oral literature, general dictionaries, history, geography, archaeology, agriculture, botany, medicine and development studies. Because of this spectrum of included materials this bibliography appeals to a wide variety of researchers, providing valuable insights into the philosophy or mentality of these peoples. The entries are sorted alphabetically by author. Every single entry classifies the content using keywords, lists the languages of the ethnic groups concerned and provides the bibliographic data and cross references. By providing the language data the bibliography allows easy reference to the material contained in the linguistic bibliography by Roncador and Miehe 1998 (see link below). A list of Gur languages and corresponding ethnonyms as well as an index which is subdivided by individual languages complete the volume.